As was requested by one of my blog followers/subscribers, the following is a series evaluating the SCSM Dashboard “Ensight” by Expit. 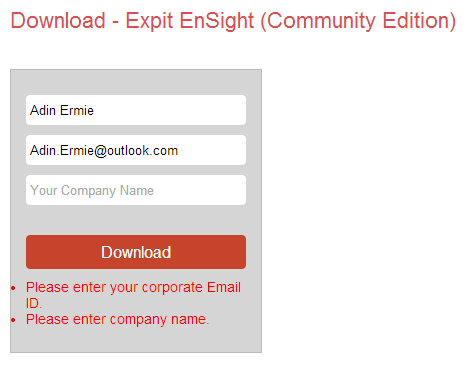 In our previous post, we were introduced to the SCSM Dashboard called Expit EnSight. First, navigate to to the main EnSight page, located here: http://expit.com/expit-ensight/m/60. Click on the ‘Download‘ button. This will bring you to yet another page, that shows the System Requirements for the product, with yet another ‘Download‘ button to click. After clicking this second ‘Download’ button, you will be prompted to supply your Name, Email Address, and Company Name. However, if you attempt to enter a personal email address (i.e. @gmail.com, @outlook.com, etc.) you will NOT be allowed to download the product! You will be informed that a “Corporate” email address is required. 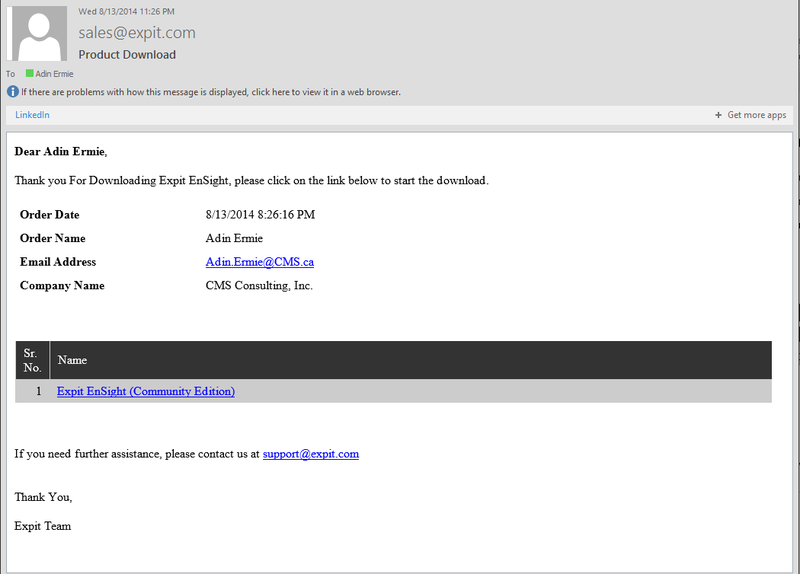 This is extremely annoying, especially since this occurs when you are trying to download the FREE COMMUNITY EDITION! I am told by the company, that they are working to change this functionality, however that was back at the beginning of July (so it’s been over a month with no changes). Within a little time, you will receive an email (at the address you provided), that will look something like this. When you click on the link provided in the email, you will be brought to a webpage, with yes, another ‘Download‘ button. Finally, when you click this ‘Download’ button, the product will be downloaded to your local system. 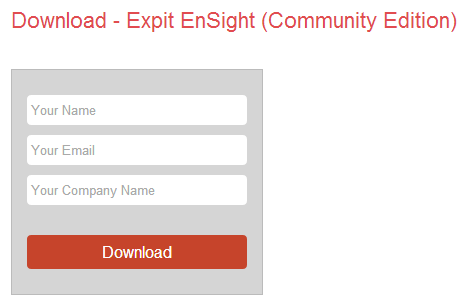 As of the time of this writing, the latest version of Expit EnSight is 2.25. Personally, I think between forcing you to provide a Corporate email (for a free Community Edition of the product no less), along with the many ‘Download’ buttons you have to click, and the long and drawn-out process you have to follow just to download the installation file (which by the way doesn’t come with any installation/configuration guides within the ZIP file); makes the first impressions of this product less than positive. After all, normally I wouldn’t have to write an article page dedicated to “downloading” the product, but since this product’s process is needlessly obscure, I wanted to ensure that my followers/subscribers had some guidance around this process (and maybe motivate the company to change/improve the process). In case anyone reading this article has difficulty finding the installation/configuration guide, it can be found on the right-hand side of the main Expit EnSight page (as depicted below). 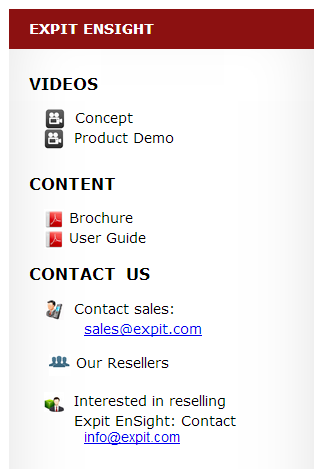 Here is a direct link to the Expit EnSight User Guide. In the next article, we will walk through the basic installation. As always, if this post helped you in any way, and you would like to show your appreciation, please rate it, comment on it, and share it via any other social medium. Also, feel free to contact me (via the About Me page) with requests for future articles.